Born on 24th September 1991, Srishty Rode is an Indian Tv actress mainly known for her work in daily soaps. She made her acting debut with the show ‘Yeh Ishq Haaye’ which premiered on Star One. She portrayed the role of an ambitious girl who put all her efforts to fulfill her dreams. The show gained her immense popularity, and the diva grabbed opportunities to play as a lead in other daily soaps. She has also been featured in many commercials including Fair N Lovely and others. Currently, she is the participant of India’s most controversial reality show Bigg Boss 12. The show is hosted by B-town actor Salman Khan. Let us know more about her personal and professional life below. Born in Mumbai, Maharashtra Srishty did her schooling from St Louis Convent High School and later joined Mithibai College for further education. Her father was the director of Photography in the industry. Initially, he was not in favor of Srishty to pursue her career in the same industry. Surprisingly, her appearance in Fair N Lovely advertisement earned her recognition, and he allowed her to become an actress. She initially pursued her career as a model and also featured in several ad campaigns and ramp shows. Srishty then played key roles in ‘Chotti Bahu’ (season2) as Radha, as Sarita in ‘Punar Vivah – Ek Nayi Umeed’. She came into limelight after portraying the role of Anushka in the show ‘Saraswatichandra’. Not many of her fans know that she is a trained dancer. Srishty also runs her youtube channel ‘Srishty Rode‘ in which the diva shares all her singing, dancing, and other videos. The actress was last seen in ‘Ishaqbaaz’. 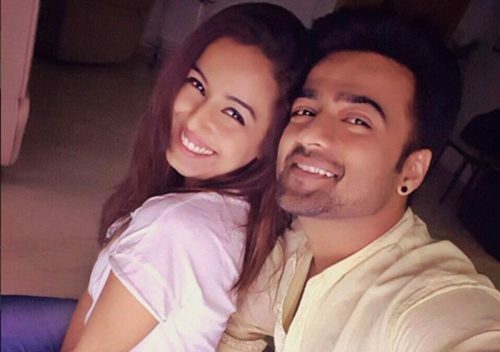 Srishty is engaged to Manish Naagdev. The duo first met through a common friend in a party and later fall in love. The couple got engaged on 15th February 2017. Going by their Instagram posts, the two are inseparable and are madly in love with each other. Currently, Saraswatichandra actress Srishty is the participant of Salman Khan’s show Bigg Boss 12. She is one of the glamorous divas in the season. It was also rumored that her partner Manish was also approached for the show but, he declined the offer. The diva gave a mesmerizing performance before stepping into the house. On the first day of the show, the actress has warned contestants not to share a bed with her. We are expecting drama between Srishty and another telly bahu Dipika Kakar in the Bigg Boss house. For other contestants biographies visit: Roshmi Banik, Kriti Verma, S. Sreesanth, Neha Pendse, Deepak Thakur, Romil Chaudhary, Nirmal Singh.